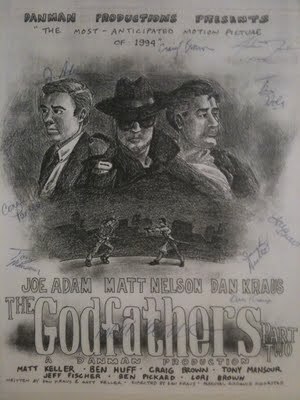 The Godfathers: Part Two was so big, it required hype. Above is the sole existing copy of the promotional artwork drawn by Matt K. As you can see, I began to gather the signatures of all the cast members during shooting but never finished. I hope to remedy that one day. Okay. Prepare yourselves. Here it comes. What can one say about perfection? I choose to say nothing.